Born and lives in Sandy Hook, Elliott County, Kentucky. Leroy Lewis is not only a folk art carver but a fine furniture maker who utilizes care and painstaking technique. Leroy's work was featured in Local Visions written by Adrian Swain director of the Kentucky Folk Art Center in Morehead, Kentucky. 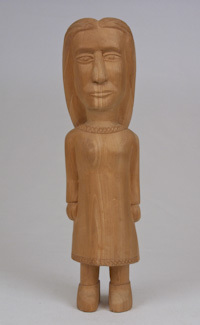 Leroy's wife Connie is in involved by demonstrating carving to the local schools but also as a means of creative expression. 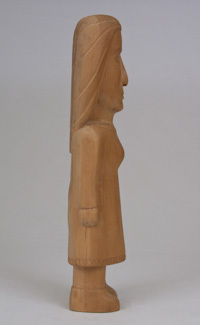 Leroy Lewis's individual carvings are not as common as balance of the Lewis clan. 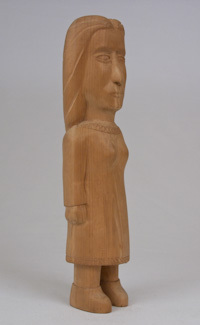 The "Indian Maiden" in our collection is a beautifully rendered carving which appears to be from basswood. It is signed and dated 1992.